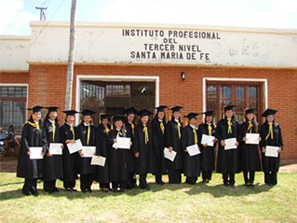 In 2000 a Jesuit priest, Antonio Betancor, initiated a project to offer free tertiary-level education in Santa María. This developed into the Instituto Técnico Superior, Santa María de Fe, which provides a two-year training in Food Technology, which enables many of our young people from the poorest homes to get jobs in food production companies around the countryside. SMEF did not begin the Institute, but since the beginning we have been practically the only source of financial support. The Institute now has around 70 students, and the education is still free. There are two good-sized buildings, which SMEF has purchased and maintains, but the ownership belongs to the local diocese. There is room there not only for Food Technology – with a laboratory, a kitchen and a computer room – but also for the English classes and a wide range of other occasional courses at low cost (including computer classes, electricity, hairdressing, dance, handiwork, bakery and holiday courses for children). The Institute has become an educational centre for the whole area. Keep up with the students and their progress via their Facebook page!